The term corporate espionage has been taken to a new level in what surely ranks as a more significant than the phone hacking scandal.The revelation that News Corporation, via its News of the World Paper, hired a covert hacking team called NDS to dismember competitors revenue generating mechanisms has reminded us of the dangers of monopoly and self interest. As I write, the share price for News Corporation has barely budged on the ASX, where investigative journalist Neil Chenoweth from the Australian Financial Review has released exclusive headline stories over the last three days, detailing these gross attacks on the free market. Similarly the NYSX records that News Limited has only dropped 28c or 1.4% over the last 5 days. The ensuing legal cases and challenges to the Murdoch brand as ‘fit and proper’ characters to hold a media license will surely challenge shareholder faith, where the push for greater concentration of media power amongst the News brand is afoot in many continents. The information uncovered by Chenoweth suggests that NDS attacked the pirates and prosecuted them, but in so doing obtained encryption codes for the cards operated by rivals. Using that knowledge, it promoted a wave of high-tech piracy that damaged Austar and Optus, the pay TV rivals of Foxtel, which is 25% owned by News Ltd.
Foxtel is now poised to buy Austar. The piracy cost the Australian pay TV companies millions of dollars a year and undermined Austar’s finances. As well as harming rivals by fostering piracy, NDS also appears to have withheld a piracy fix from client DirecTV for 15 months just as News Corp chairman Rupert Murdoch was set to buy the company in early 2000. This cost the DirecTV millions of dollars in revenue , depressing the company’s value. NDS was paid more than $90 million to provide security top DirecTV. This is just the tip of the ice-berg. We have read with concern this week how dangerous the concentration of wealth is when hacker turned whistle blower Jan Saggiori was taken to court on trumped up accusations that internal emails reveal were never legally sound. “We . . . have no case against Jan,” the US executive overseeing the lawsuit, former Army intelligence officer John Norris, told Adams two months after it was served on Saggiori, yet legal proceedings continued for another nine months. The accusations and threats from a major legal firm were to scare fellow whistle blowers from engaging in any similar revelations. For a single individual to receive such threats would compel visions of legal eagles tearing one’s life apart. One could imagine Mr Saggiori having comparatively fewer resources to defend himself, revealing the legal barrier to entry exorbitant lawyer fees place on our right to self-defense and thus the opportunity of freedom. The same Rupert Murdoch who was so threatened by the internet and the free provision of his news services found it fair practice to condone or create a corporate atmosphere where such espionage inherent in hacking his competitors encryption codes was acceptable. To then offer his competitor’s content for free to undermine revenues, enabling him to buy up these companies to entrench his monopoly simply beggars belief. Then he resorts to twitter to attack his critics as trying to defend their monopolies? He is of course talking of those at the Guardian newspaper, the Fairfax Press and the BBC’s Panorama show (who did an investigative show this week on the topic). We have a busy weekend reading through the 14,000 emails that the AFR have asked the online community, the online commons, to investigate. Read through this story to find the Surrey Police force connection. Then ask yourself if we can trust the Murdocracy as a fit and proper representative of freedom of the press, one of the hallmarks of liberty and democracy. Excellent post! Do we need more reminders about the perils of concentration of power, and the means to which all-powerful monopolies go to protect and expand their privileges? Land also behaves as a monopoly (no cost of production, never-ending demand, with all wealth collapsing into land values). Prosper is the only major think tank aware of the monopoly privileges of outright land ownership, and Prosper’s solution is rock solid. Keep fighting the good fight! 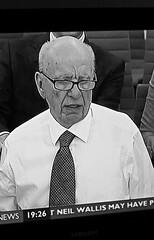 The issues show the total corruption of the Murdoch regime. “Power tends to corrupt, absolute power corrupts absolutely. Almost all great men are bad.” The events are no worse than can be found in any corporate body. It is the fundamentals of incorporation here that bring about the wrongdoing. The laws protecting companies is itself corrupt. You point out that the share price has hardly moved. This clearly illustrates that the corruption is not only within the company but with its shareholders, who obviously condone what has been done, and the legal systems that operates both here and in the US. The charges made against the Swiss man are surely a misuse of the law and in itself an offense? But I see no mention that the Murdoch empire will be prosecuted! Whilst it may be criminal to attack, as appears to have been done here, the other companies, it is a greater crime to attack an individual who, in our society, is least able to defend themselves from the predatory nature of the big corporations. Where did the “Golden Rule” operate here? The events in the UK are shocking enough; they encompass members of the police force and have reached into the Cabinet. But Mr. Murdoch is able to start a new newspaper! Suggesting that despite all the noise nothing substantial will come of it. The land question, the misappropriation of the rent of land, is the base of all corruption. The greed, the largesse, the self praise, the mean and cruel treatment of human beings, the extreme wealth and the extreme poverty, is all here in the land question. Murdoch may be an interesting and illustrative sideline, to bring him and his ilk to heel will take a massive effort to bring about the public collection of the rent of land. Nothing less will suffice.